Recently I read an interesting and insightful book by John E. Sarno titled The Divided Mind. 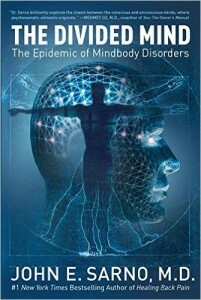 Sarno argues that the mainstream medicine is forgetting and disregarding the importance that our psychological state and, as he says, especially unconscious emotions play in the onset and perpetuation of health problems such as back and neck pain, carpal tunnel syndrome, tennis elbow but also many skin conditions, allergies and so on. He describes a mechanism behind the back pain, that is usually, wrongly, ascribed to a herniated or bulging inter-vertebrate discs, scoliosis, etc. According to Sarno, the physical problem is a defence mechanism against the emergence of unacceptable unconscious rage, anger, sadness or similar. Instead of experiencing these emotions one suffers from pain because of decreased oxygenation of certain tissues. These body-mind or psychosomatic disorders are especially prevalent in the West, where the mind and the body are completely divided. Apparently in the West we are unable to grasp them differently than how they are seen in our scientific (medical as well as psychological) paradigm – that is in a dualistic way. Just knowing about this mechanism and accepting the psychosomatic origin of pain has proven to be effective for thousands of Sarno’s patients and readers of his books. Such a view challenges the effectiveness of modern medicine in terms of healing back pain and, at the same time, lays the responsibility to the patient or person themselves. The importance of seeing the connection between or inseparability of the psyche and the soma (the mind and the body) has been stressed in some psychotherapeutic approaches (e.g. existential, Gestalt, body-oriented, etc.) but is far from accepted in the mainstream medical and even some psychotherapeutic approaches. Sarno’s approach opens up the holistic field of body-mind medicine that can perhaps empower people to help themselves way more than they have been able to do so far. The question is: do we want that freedom and responsibility? And does the medical system want us to have that freedom?